Well this was meant to be a post about the lightest most perfect Victoria sponge cake. However it wasn’t meant to be, not today anyway!! Baking cakes, I have had a few successes, but not any with the classic sponge. A pot luck food blogger afternoon tea party seemed the perfect occasion to rectify that. It didn’t quite turn out as it should, and I really cannot blame the domestic goddess. So this is more of a what not to do when baking a Victoria sponge. Post of a few food blogger tips there should be perfectly light, cream and jam filled sponge sometime very soon. So I did turn to the domestic goddess and if I had just followed her instructions to the letter I am sure everything would have turned out peachy, or at least golden and feather light. The recipe did call for very soft butter and to be honest mine was on the soft side but very soft, maybe not, and apparently this is quite key! Error number two, that batter just didn’t seem quite sufficient to go in to two cake tins so I piled it all in to one. I believe this was the fatal mistake, especially as I didn’t adjust any of the cooking times. What appeared from the oven looked golden, the skewer came out clear (what would later be deceptively clear!) and I thought I had cracked the perfect sponge. However, and it is quite a big however when I went to turn out the cake it fell apart due to the completely liquid and uncooked centre. Not to worry I thought let’s just pop it back in the oven for a few more minutes. It was however to no avail, the middle seemed determined not to cook. On a positive the cooked bits were quite delicious and I am determined to produce the perfect sponge. So that is what led to the stand by brownies. Thank goodness for that other domestic goddess Donna Hay and back up brownies that can be whipped up in a flash, sprinkled with a little strawberry powder for a little sharp fruitiness, chocolaty goodness in about half an hour. Along with the classic cucumber and egg mayonnaise sandwiches the beginnings of a very lovely afternoon tea along with Eat Etc, Pease Pudding, Plum Kitchen, Cook the Books, Sasa and what a feast we had. All served on my Gran's beautiful Wedgewood tea set, it finally got a well deserved outing. On the savoury side zucchini and carrot mini muffins from Plum Kitchen and homemade oatcakes with salmon and cream cheese from Pease Pudding. Afternoon tea wouldn’t be right without some sweet treats and we had then in abundance. Ginger loaf with a zingy icing from Eat etc, the classic Kiwi Lamington from Cook the Books and a Linzer Torte from Sasa. Certainly no need for dinner! So if you ever need to whip up a sweet treat in no time at all try these Back Up Brownies. Place the butter, sugar and cocoa in a medium sized saucepan. Over a low heat stir until the butter is melted. Spoon the mixture in to a bowl and add the vanilla extract and the eggs and whisk well to combine. Sift in the flour and whisk well again to combine. Spoon the mixture in to 20cm square cake tin lined with non stick baking paper. Pop in the oven and bake for 30-35 minutes until the centre is just set. Cool in the tin and then cut in to squares. If using, sprinkle with the strawberry powder. Place the sliced cucumber in a colander and sprinkle with a little salt and leave to stand for 30 minutes. Rinse and pat dry. Spread the butter on the bread and layer the cucumber slices. Cut the crusts off and cut in to triangles or fingers. As soon as the eggs are boiled peel and place in a bowl with the butter*, mayonnaise and a good seasoning of salt and pepper. Spread the mixture on to the bread, cut the crusts off and cut in to triangles. *For me this is the key to perfect egg mayonnaise; adding the butter and mayonnaise when the eggs are still warm. So call up your girlfriends, dust off your tea set and pop the kettle on and settle in for a little afternoon tea. This is my entry for this month's Sweet NZ being hosted by the lovely Kristina over at Plum Kitchen. Thanks Alli, it was fun....we must get on the next get together post NZFBA....cannot wait for the weekend! A lovely Sunday afternoon tea with such delicious food that I couldn't decide what I liked best. I really liked the colour and design of the tea set. Thanks again. By the way, I'm going to make that almond, blueberry and apple loaf from your other post one day. Looks divine! Thanks Lesley....hope you enjoy the loaf. Sorry to have missed it! Max is better now (although as soon as he got back to school he managed to fall and break his front tooth... apparently this is all normal with boys.. the only thing I can say is that I better go and colour a few of my new white hair before the conference!!!) but I am quite exhausted! 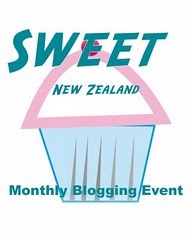 Glad to see that you used the strawberry powder too :-), and great entry for Sweet NZ! Thanks Alessandra, happy to hear Max is better & looking forward to seeing you on the weekend.